You don't normally expect a book from Focus on the Family to theologically deep. This one is. Author Alex McFarland didn't produce a book of dumbed-down theology you could hand to your son and say, "Hey, kid, just read this." Raising godly children is not simply a matter of giving them correct data. 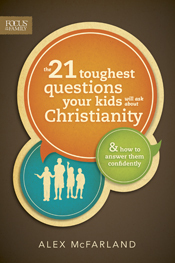 No, The 21 Toughest Questions Your Kids Will Ask About Christianity is for you, the parent, to read, so you yourself will know the truth about God, Jesus, the Bible, the Church and a slew of other topics. In the process, you'll equip yourself to pass on the historic truths of Christianity to the next generation. While there are parts that I would disagree with, on the whole the book is solid, more conservative than normally found in mainstream evangelicalism. McFarland covers a wide range of topics without being too skimpy or too verbose. If you have children and will read this book, let me know. I'll mail a copy of the book for free to one of you. It isn't hard to see that mobile devices can be helpful tools. But it can be overwhelming to find the good among the gazillions of apps out there. Here are some of my favorites. These are also all free, which is probably why I like them! Now, please share some of your favorites! I recently had the opportunity to stay with a Muslim family for several days. It was a wonderful experience. They were incredibly hospitable. I encourage other Christians to look for similar opportunities. I say this because sometimes Christians, sadly, tend to react to Islam in fear or hopelessness. There is no reason for either. It seemed easier to talk about the message of the Bible with my Muslim friends than with my neighbors. I didn't make any converts. But that's not my job anyhow. My job is to be a faithful ambassador for Jesus, an ambassador whose words and actions correctly reflect the gospel (2 Corinthians 5:20-6:1). God is the only One who can cause a heart to embrace the gospel. Living with a Muslim family did not cause me to love Mohammed or the Qur'an. But it did cause me to love Muslims more. I will pray more intently for Jesus to save them. I hope to stay with Muslims again. And I hope you will too. Several years ago I signed up to participate in Open Doors' campaign to have 24/7 prayer for North Korea. I pray from 2:20 to 2:30 on Friday afternoons. Usually I spend that time praying through recent news or documentaries about the DPRK. This video produced by the BBC is one of the best I have seen recently. Watch, and pray. Ray Comfort, who produced 180Movie and Genius, has now added a third short, fast-moving documentary to his arsenal. Watch it free at EvolutionVsGod.com! After my post a few weeks ago telling the story of God guiding Jim to find the alternator for the guys in O'Reilly's, a loyal blog reader (one of my tens and tens of readers, as Todd Friel would say) wrote in with her own story of God's guidance in finding a lost object. We were at an auction near Denver many years ago. After registering for a bidder's card we stood around near that area because it was indoors and the morning was cold. A woman started acting very agitated and then began to say that she had lost the diamond out of her ring and she felt certain it was after she had entered the small room. No one could see it while searching the uncluttered floor. Then [my husband] prayed to be able to help her and then he felt led to walk over to the registration counter and he felt down and under the facing panels which stood out from the foundation of the counter. he found it and held it to her and asked if was her diamond. She was happy and said yes and seemed grateful. He told her he'd prayed for guidance. She happily accepted the jewel. But THEN she seemed to change to a demeanor which implied that he'd seen it earlier and kicked it under so he could pocket after she left. Oh well. She missed the blessing of knowing God had done it. The man in the car shop accepted the blessing. In 2008, the NY Philharmonic played in Pyongyang, North Korea. I wrote an article about it then. Recently I discovered the wonderful documentary that was produced about this historic cultural exchange. Watch, and use as fuel for praying for Jesus to bring freedom to this most enslaved nation. North Korea's greatest music is still ahead.